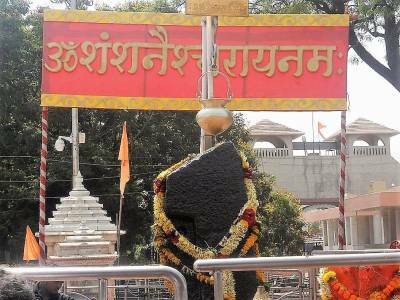 The Shani shingnapur Temple of Ahmednagar is an extremely revered and holy shrine of worship for Hindus dedicated to the deity Shanideva. 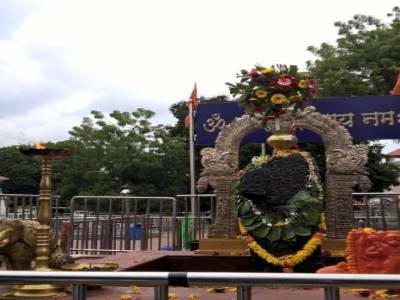 The Shani shingnapur shrine is especially famous because the main shrine of the deity Shanideva is represented by a black rock in the middle flanked on either side by trident and a stone sculpted image of the revered bull in Hindu mythology, Nandi. 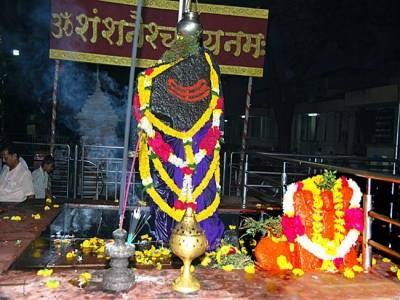 The black stone representing the Shanideva, who is the reigning deity of the planet Saturn, is believed to be self born or manifested out of thin air as opposed to being carved and installed. Legend associated with this shrine has it that when the stone was first chanced upon by a simple shepherd at least four thousand years ago, he prodded it with a stick out of curiosity and the stone started bleeding. The same shepherd was later visited upon by the deity Shanidev in his dreams who instructed him to worship the stone as it was his self manifested form and advised the shepherd against building a roofed temple structure for housing his manifested form. Upon doing so the shepherd was promised that the village would be free from the fear of theft or burglary and thus in continuity with the legend to this day, none of the houses in the quaint temple town of shingnapur have any doors, just the door frame. Even shops and trade houses and similar establishment fall in line and lack a door. It is a very strange sight to see this sort of a consistent display of faith and strangely the village has never reported a theft since inception till recently in 2010. 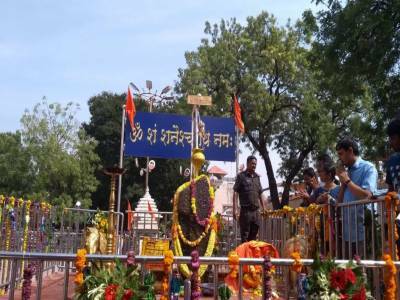 Shani Shingnapur temple, located a rough hundred kilometres approximately from Pune and about hundred and fifty kilometres from Aurangabad, is a small village famous for the Shanidev temple which receives at least half a lakh footfall of devotees on normal days and upto three lakh devotees on auspicious occasions. It is a very holy place of worship and the manifested image of the presiding deity is said to be highly invoked to grant wishes and make dreams come true. 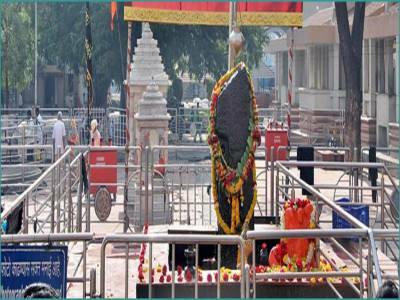 Get quick answers from travelers who visit to Shani Shingnapur Temple.